Thread: Painter X Help - Colors ALWAYS fade upon saving! 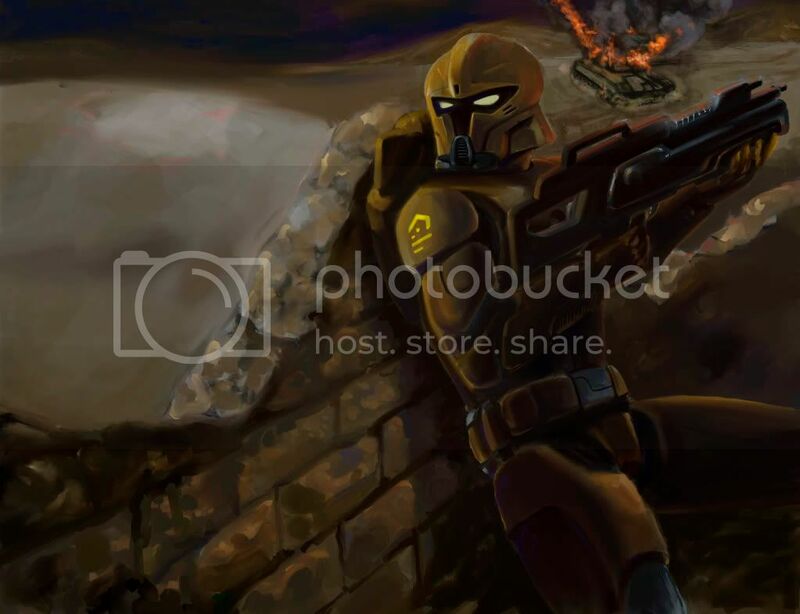 I'm new to this forum and I've just gotten into using Painter X. I've been working on this sci-fi oriented design for a while now and the painting was turning out pretty well until I ran into a major problem; I noticed that every time I save and re-open the file (oil as the medium) the painting fades in color and takes on a turquoise blue overtone to it. This is very frustrating as I've had hour long sessions repeatedly trying to fix the colors up only to realize the same problem recurring - all of the darks fade into a lighter tone and the greys turns into a green-blue. 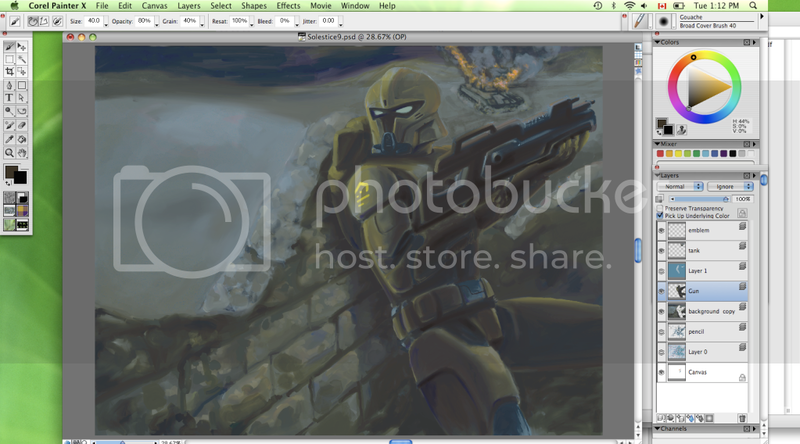 I initially started working on the file with different layers in photoshop and then imported it into Painter. I noticed that even the original black pencil drawing I scanned in turned turquoise. The problem worsened every time I resaved the file and tried to reopen it again. It's almost as if there's an automatic filter that was turned on. I've been looking all over the net in finding an answer but to no avail. Please help me out if anyone knows the solution to my problem - is it a layer option or brush option that I did no turn on which saves the colors vibrancy? Please help me save my painting Thanks so much in advance guys. I appreciate it. I know the screencaps show it as a psd, but was that when you just switched it over to Photoshop, or did you use psd as a format throughout the whole process? For some reason, .riff is a weird and buggy format. I've had painter crash on me and screw with files a few times when I was using the .riff format. Once I stopped and switched to using psd's in photoshop, everything was smooth sailing. Hi Gorgonzola, thanks for your reply - I've been using PSD format the entire time in Photoshop and Painter. I am, however, using Painter X that was downloaded for trial version - would this have something to do with it? I was definitely going to purchase Painter until I ran into this problem - it's put me down quite a lot - especially when you fall in love with your artwork only to realize that it's only an ephemeral thing. I'm quite devastated with the painting's current look to say the least. look at the panel with color wheel on your "blue" screenshot. move your eyes a little left, you will see 4 small icons: black/white cube, grid, little screen with colors and a star. click on a little screen with colors, it will toggle color correction on and off. I have worked extensively with digital art for the past four years and seem to always have this same problem when printing anything. The colors on the screen always appear a tint different than a hard copy print. With Painter, for some reason when printing any file the colors appear slightly tinted in variation as opposed to printing in another program such as Corel Photo Paint, Photoshop Elements, or Corel Paint Shop Pro. Despite all efforts to coordinate color through management programs the same problem results. I recently looked at two versions of the same type of file format; one created with Painter and another created with Corel Photo Paint. They looked different, the colors in Painter appeared to have more lustre, yet sometimes when printing through the Painter program, colors do not appear as good compared to Photo Paint. The technical details are far beyond my level of experience and knowledge, I have no idea why this occurs. Your best solution is through trial and error. Develop a system of producing an end result that is closest to the intended plan. After many attempts through trial and error you will start to recongnize a pattern of ways to anticipate an end result. The other less complicated solution is work in traditional media. You always get what you see in that situation. Painter works in RGB so keep your color gamut in Photoshop the same if you want to go back and forth. Set your color management up similar to what John Derry recommends on his site. A link to his site is below. Lastly the color engines used for interpreting the color spaces are different in both programs. So you'll always get a little variation between the two programs. You'll have to readjust it to what you want when you're finished with the picture, but if you set all the above up then you'll greatly reduce the difference.